President Barack Obama's renewed push on improving the nation's stagnant economy has many pundits wondering whether the initiatives he laid out last week aren't too little too late to stem losses at the polls come November. A recent NBC/Wall Street Journal poll among likely voters showed that the outcome overwhelmingly favors Republicans winning control of Congress. Whether Obama's $50 billion program, which includes tax credits for businesses to spur capital spending and infrastructure spending on roads and bridges, is enough to sway voters, remains to be seen. But a fresh batch of data show that the job market may finally have turned the corner despite last month's uptick in the national unemployment rate to 9.6%. 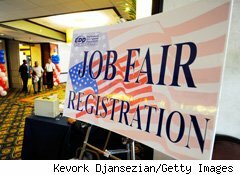 First, there was last week's Labor Department report that showed initial claims for unemployment benefits unexpectedly fell by 27,000 to 451,000. The four-week moving average, a more-telling barometer, also declined 9,250 to 477,500, while continuing claims dropped 2,000 to 4.48 million. Then, earlier this month, another indicator showed that employed Americans can feel more secure that they will keep their jobs. 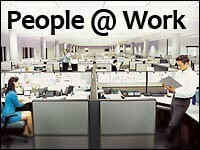 The number of announced layoffs fell to the lowest monthly total in more than a decade in August, according to a report by employment-services firm Challenger, Gray & Christmas. At just under 35,000, August job cuts fell 17% from the 41,676 cuts announced in July, marking the first decline following three consecutive months of increases, Chicago-based Challenger said. August not only replaced April as the lowest job-cut month of the year, it represents the lowest since June 2000, when employers announced only 17,241 planned layoffs. The lack of massive culls of workers from nation's largest firms is another positive indicator that the U.S. job market may finally be headed in the right direction. Gone are the epic cuts announced in 2008 and 2009, when Citigroup (C), General Motors, Berkshire Hathaway (BRK.A) and Starbucks (SBUX) each cut tens of thousands of jobs. Further, as U.S. News & World Report points out, every major employment sector is hiring, according to a sampling by job search engine Indeed.com. In the 12 industries Indeed.com monitors, hiring rose significantly in August compared to a year ago. The biggest surge was in transportation, where job postings jumped 119%, but information technology, manufacturing and media and newspapers also saw strong gains, up at least 61% above year-ago levels. Then there's one other quirky nugget of information dug up by Challenger: Sales of men's suits are on the rise. Citing better-than-expected quarterly earnings at Men's Wearhouse (MW), Challenger says increased suit sales may mean more people -- men, at least -- are going on interviews. Although, the firm says there was no indication from the Houston-based retailer for the reason behind the sales boost. After years of a trend toward more casual dress in the workplace, Challenger CEO John Challenger says many job seekers simply don't own a suit that fits or is in fashion. "So, they are heading out to restock their suit collections." Whether suit sales or any other barometer can predict an uptick in the job market is anyone's guess. But one thing is for sure: with 8 million jobs lost since the start of the recession in December 2007, many more months of promising data are needed before everyone looking for job can finally find one.